Brownsville City Hall is located at 111 North Washington Avenue, Brownsville, TN 38012; phone: 731-772-1212. Photo: Joshua K. Hutchinson House, ca. 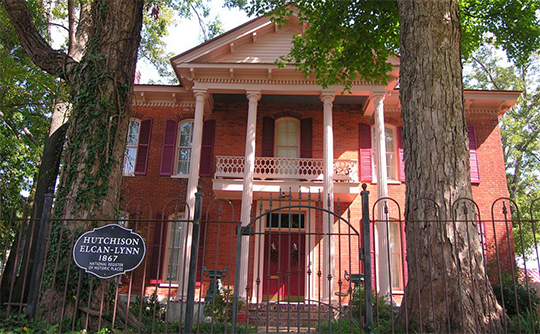 1867, 124 North Church Avenue, Brownsville, TN. Listed on the National Register of Historic Places in 1988. Photographed by User:Spencer Kellum (own work), 2014, [cc-by-3.0 (creativecommons.org/licenses/by/3.0)], via Wikimedia Commons, accessed February, 2017. In 1823, Haywood County comprised 575 square miles divided into fifteen Civil Districts with the eleventh to fourteenth lying to the north of the Forked Deer River. Geographically located toward the center of Haywood County, Brownsville was selected as the county seat through a legislative act on October 16, 1824 and named after General Jacob Jennings Brown of Pennsylvania for his contributions in the War of 1812. General Brown was said to have had a trading post on the southeast corner of the town square even before the treaty with the Chickasaw Indians. The legislative act creating Brownsville as the county seat stipulated that a commission be appointed to create a plan for the town, sell lots, and erect public buildings. It required that the city be fifty acres with a four-acre town square. On December 14, 1825, Thomas M. Johnson deeded the required fifty acres to the planning commission of Brownsville for one dollar plus one town lot. While the town plan fulfilled the stipulation of fifty acre size and that the roads be ninety feet wide, the city square only took up two and seven-eighths of an acre rather than the four acres required in the Act. The town was one square mile and all the boundary streets were named Margin, i.e. N. Margin, S. Margin, E. Margin and W. Margin. Brownsville incorporated in 1826. In 1835, part of the county to the west was divided to create Lauderdale County. The fifty lots that were created in the initial legislative act in 1824 were sold and sufficient funds were raised to begin erecting public buildings to include the first Haywood County courthouse on the square. As seen in an 1842 town plat map of Brownsville, it is illustrated that the first town expansion was one square mile equidistant from the courthouse to the new city boundaries and included a total of 150 lots. The map also indicates that the original "Margin" streets were renamed from N. Margin to Franklin Street, W. Margin to Hatchie Street, S. Margin to Jefferson Street, and E. Margin to Jackson Street. It also depicts Main Street running from east to west on from the center of the public square and Lafayette and Washington Streets along the east and west sides of the square running from north to south. Rebecca Hightower, Thomason and Associates, North Washington Residential Historic District, Haywood County, TN, nomination document, 2014, National Park Service, National Register of Historic Places, Washington, D.C.